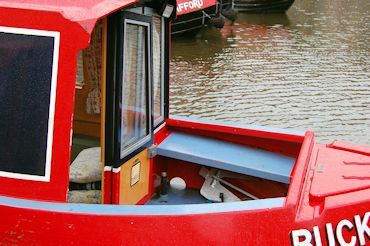 Our main business is the operation of self-drive holiday hire boats on the canals. Canal holidays are enjoyed by many people with special requirements or who are less mobile. For safety, a minimum of two active crew is required for handling the boat and operating locks. We provide full boat hire training. 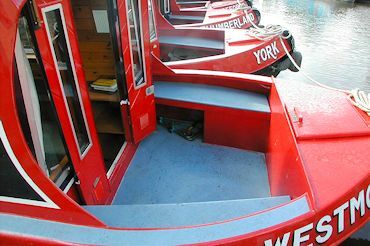 We also operate moorings, a full-service boatyard, canal shop and small chandlery. For directions, map and public transport, please see how to find us at Sowerby Bridge or at Barnoldswick. A large print version of this statement is available on request. Car parking is available on site, free of charge. Vehicles can be parked with rear access. The car park and access roads are surfaced in stone setts, and are fairly uneven with some small trip hazards. There are no curbs. There are no marked disabled bays, but suitable space can be reserved on request. Boats are generally moored alongside one another, so it may be necessary to step across other boats to get to yours. We will ensure that your boat is moored immediately next to the bank on request. For loading and unloading the boat, the car can be placed close to it. We are happy to help carry baggage. There is no special signage. The gate to the yard is open during working hours. A key is provided on the boat. The entrance is through a very wide door to a lobby. A 6" (150mm) step leads up to a 31" (800mm) door with spring closer, leading into the reception/shop. There are no handrails. A ramp is available on request. Assistance is available on request. There is no induction loop. A pad and pen are available on the reception desk. The shop is brightly and uniformly lit by spotlights. There is a stool in reception, and chairs are readily available. In the Canal & River Trust sanitary station - ground floor in a nearby building. On the first floor of our building - access by external lift, code on request. Both are standard unisex disabled toilets. Please check arrangements direct with them. 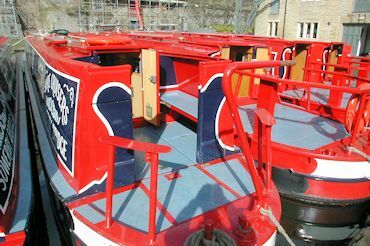 Our boats are typical narrow boats. Please see layout drawings and photographs in brochure or website. External decks are painted with anti-slip paint. Corridors and doorways are typically 20" (500mm) wide. Most corridors pass from one side of the boat to the other; some boats have centre corridors. Headroom is at least 6' 2" (1880mm). There are no handrails within the boats. Flooring is felt-type man-made carpet, vinyl flooring or ceramic tiles. Seating is mainly settees with additional stools. Tables fit in only one position, but are demountable and can be stored out of the way. Low-level single beds are typically 2' x 6' 3" (600x1600), and doubles 4' x 6' 3" (1200x1600). 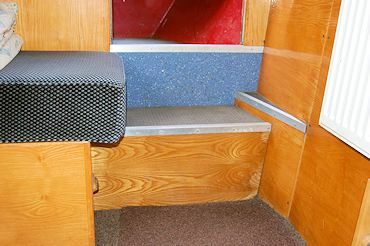 Removable top bunks are appreciably narrower. Beds have foam or sprung mattresses. Bed height to top of mattress typically 20" to 24" (500mm to 600mm). Duvets and pillows are filled with hollofibre. Linen is polycotton. No feather pillows are used. Back decks are either cruiser or semi-trad style. 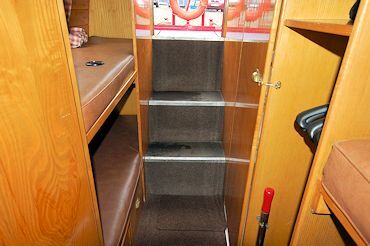 The decks are level, though there is a raised cill on the back deck of some semi-trad boats; ask for details. Front decks have seats on each side which double as steps, up to 18" (450mm) high, for boarding. The step up onto the boat will depend on the height of the bank at that particular point, and will generally be less than 18" (450mm). 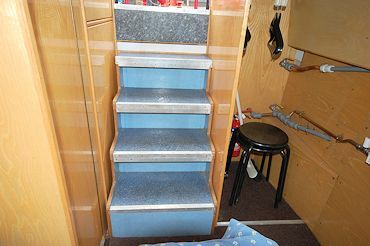 All boats have steep steps for access to the cabin. From the back deck, access down into the cabin is by 2 or 3 steps, with tread depth between 8" and 12" (200mm to 300mm), and rise of 10" to 13" (250mm to 325mm). From the front deck, there are one or two steps, less steep than at the back. At both ends there is a door sill of 6" to 8" (150mm to 200mm). One gang plank is provided, for use when the boat cannot be moored close to the bank. Planks are approx. 8' x 8" (2400x200), with anti-slip paint one side. 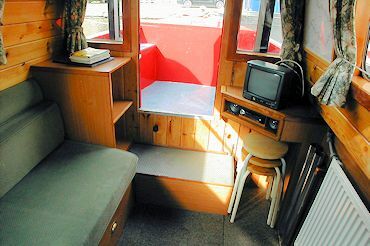 Colour TV is provided on all boats. The screens are 16" (400mm) or bigger. Lighting is by 12 volt strip lights and small bunk or spot lights. Powered by limited batteries, lighting is not of domestic-standard brightness. Heating is by diesel or gas-fired boiler supplying radiators, with thermostatic control of the water temperature. Bathrooms are of restricted size compatible with the boat. Most showers have a step 18" high. Sit baths have a seat 17" (430mm) by 8" (200mm) deep by 24" (600mm) wide. There is a cill about 20" (500mm) high for access to the sit bath. 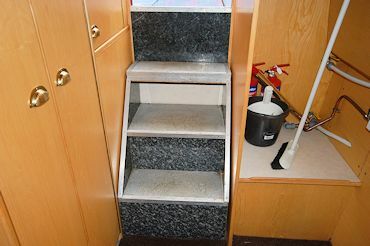 Kitchens and equipment are as described in boat details. Dogs may be taken on all boats. No charge is made for assistance dogs. All boats have 230 volt supply up to 1500 watt, suitable for recharging mobile phones and similar equipment. Please note that because all power is supplied from batteries, we cannot guarantee the continuous availability of 230 volt power. We therefore regret that we cannot take responsibility for power supply to equipment on which life depends. We prohibit smoking in boats and buildings. All prospective customers are welcome to inspect individual boats before booking, or to make specific enquiries by telephone or email. Please note that two active persons are required to handle the boat and locks, and must be free to concentrate on this while the boat is under way. A collect and deliver service is available (07742 235439). Our gift shop and small chandlery are on the ground floor; see above. Our meeting room is on the first floor. Access is by an external lift at the rear of the building, reached by smooth path from drop-off points or the main road. Access from our shop necessitates travelling round the building, partly on stone setts (see above). The corridor from the lift has one self-closing fire door which we can hold open, likewise the door of our unit. A disabled toilet is on this corridor. The meeting point is well lit, and the meeting table will accommodate a wheelchair if required. A selection of chairs is available. We regret that our boats are not suitable for wheelchairs. 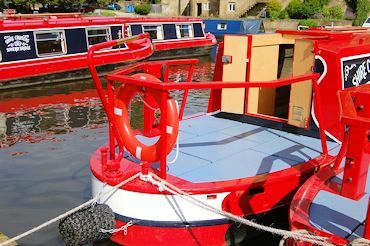 Local day trips on boats with wheelchair lifts etc. are available from Safe Anchor Trust, 01484 715572. Holiday boats are available from the Peter le Marchant Trust. Try also the National Community Boat Association.